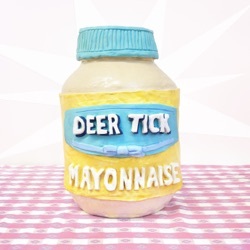 Mayonnaise is the eight studio album by Deer Tick, released by Partisan Records on February 1, 2019. This is a band interested in colours and tones. It’s essentially a side dressing. At 49 minutes it feels a little too bloated to justify its hodgepodge. Whatever way you slice it, Deer Tick’s “leftovers” are better than the main courses of many other bands. While stylistically varied and barred from its true potential by some unintelligible lines, Mayonnaise is a solid album that is worth several listens, so go get started now! A compilation of 13 new recordings of past songs and covers, Mayonnaise – and its Hellmann’s inspired cover art – are as buttery smooth as the well-known dressing. On "Mayonaise" there is actually a colorful mixture of older songs as alternative versions, cover songs and completely new songs to listen to. It offers a chance for new and old fans alike to throw on a Deer Tick album and hear the entirety of the band itself, in all of its glory, with its influences on full display. This album feels like it has a greater sense of joy by combining their best bits and crafting different versions.